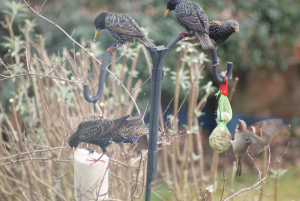 Observation - Starling - UK and Ireland. Description: Medium sized bird slightly smaller than blackbird, appears black but on close up contains irridescent greens, blues and some purple, back flecked with golden brown, under body with white, beak yellow though some show darking at the tip, legs red/pink. Medium sized bird slightly smaller than blackbird, appears black but on close up contains irridescent greens, blues and some purple, back flecked with golden brown, under body with white, beak yellow though some show darking at the tip, legs red/pink.